Add to Cart In Stock Soon! Clove is much more than a popular cooking and baking spice. It has been used for years in dental preparations, candy, and gum for its flavor and ability to promote oral health, yet it provides a myriad of health benefits. Clove is a powerful antioxidant that can help ward off free radicals and maintain a healthy immune system. 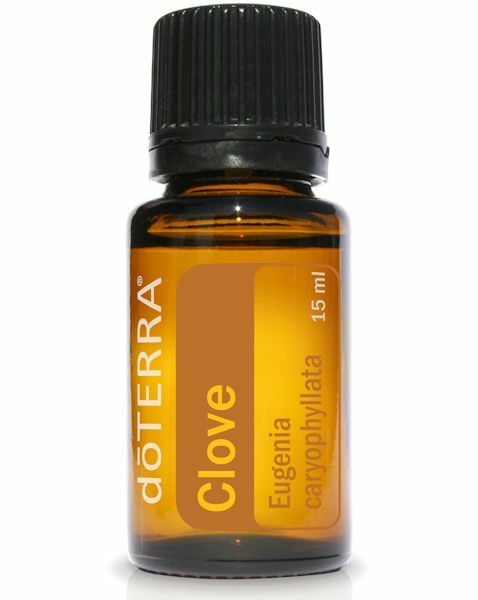 Its main chemical component, eugenol, makes clove a very stimulating and energizing essential oil that can promote blood circulation and benefit cardiovascular health. One drop of Clove can soothe teeth and gums while maintaining overall oral health. Due to its high phenol content, caution should be taken when inhaling clove directly and it should be diluted with Fractionated Coconut Oil when applied to the skin. Add one drop to toothpaste to promote oral health. Apply one drop to soothe teeth or gums. Place one drop on finger then rub on back of tongue for an irritated throat. Take in veggie capsules to boost immunity during winter time. Essential Oils come from the heart of plants and are often called, “Nature’s Medicine Cabinet.” The quality and purity of the essential oils you choose are critical to you having a positive experience with them. Essential oils are non-water-based phytochemicals made up of volatile aromatic compounds. Although they are fat soluble, they do not include fatty lipids or acids found in vegetable and animal oils. Essential oils are very clean, almost crisp, to the touch and are immediately absorbed by the skin. Pure, unadulterated essential oils are translucent and range in color from crystal clear to deep blue. When you squeeze the peel of a ripe orange, the fragrant residue on your hand is full of essential oils. Essential oils have been used throughout history in many cultures for their medicinal and therapeutic benefits. Modern scientific study and trends toward more holistic approaches to wellness are driving a revival and new discovery of the health applications of essential oils. CLICK HERE, then click the Join & Save button at the top to save a whopping 25% on ALL products with your $35 Wholesale membership with lots of money-saving perks. Got questions? Call a ThinNow coach at 1-888-424-5220. Q: Can essential oils replace any over-the-counter medication I’m taking? A: Absolutely – and typically with faster results! CLICK HERE to see our Oils-OTC Replacement chart and start replacing all of the expensive and chemical-filled items in your medicine cabinet with pure essential oil. Q: Why do these essential oils smell more potent than other essential oils on the market? A: Aroma is an excellent indication of true purity. A pure essential oil will elicit powerful emotional responses and will not be overbearing in any one note. Many people have described these essential oils as "sweet" or "extremely pleasing fragrances". This is because when plants are grown in a region in which it is indigenous, with proper nutritive soil conditions, air quality, weather/moisture, are harvested at the right time and carefully distilled, the essential oil extract will be pure and of the highest quality, thus having a fragrance that exceeds that of oils that have been diluted or synthetically produced. Unfortunately, there are many essential oils on the market that claim to be "therapeutic grade", "pure", or "natural" that do not follow strict standards for purity and potency. The best way for a consumer to know the quality and value of any product is to experience it for themselves. Q: Are these essential oils organic? A: These essential oils exceed industry standards. Because organic certification varies from country to country, province to province, and in the U.S., from state to state, it is not currently possible to acquire all oils under certified organic status. However, through the GC/MS analysis process, we are able to determine if any chemical residue exists in the essential oil, e.g., pesticides, herbicides, extenders, and solvents. With this rigorous analysis process, the company guarantees that all of their essential oils are absolutely pure as nature intended and a step above organic. Q: How often can I apply the oils? Q: How do I know where to apply the oils? A: The sole of the foot is a good place to start. Applying oils to the feet helps absorb into the system better than almost anywhere else. However, often it is better to apply to the area that is affected. For example, if you have digestion problems, apply the oils to the stomach, for a headache, apply the oils on the temple and hairline, for minor scrapes and cuts apply the right oil directly to the injured area. Keep oils away from eyes and ear canals. Q: What combinations of oils are good to diffuse together, how do I know which oils to diffuse together? A: The more you use the oils, the more comfortable you will be with which oils make good combinations. There isn’t really a bad choice. Start with combining a peppermint with a lemon or another citrus oil. One of our favorite oils to diffuse is Serenity, which has a soft, fresh, powdery scent. As you evaluate the results you are hoping for, combine oils that will help you get the overall results. If someone has a cold, you may want to try Breathe (Respiratory blend) or Eucalyptus, if you need a more calming environment, use Serenity (Calming blend). As a general rule, when you are diffusing a blend, do not mix it with other oils. Q: Is it safe to use oils while taking other over the counter cold medicines? A: You may find that the oils are actually more effective than many of the OTC medicines, and may not need to use your OTC medicines. Q: Can I overdose on the oils, like I can with medicines? How do I know if I am using too much, or applying too often? A: While the vast majority of essential oils can be used freely, there are a few that contain compounds that could be toxic at higher dosages, such as Wintergreen, Idaho Tansy, Hyssop. With essential oils, less is more. Q: Are the oils safe to use on my children? Are they safe to use if I am pregnant? A: Some of the oils should be used with extra precautions on children or if you are pregnant. Consult the Directions For Use tab for any cautions. Q: Do I have to dilute the oils before applying them topically? A: With the exception of "hot" oils (such as cinnamon, clove, lemongrass, peppermint, oregano, thyme), dilution is not required for most people. However, each person’s skin is different, and each person’s tolerance or sensitivity to the oils will vary. Most oils are very mild, like lavender, and can be applied without dilution on most people. Start out by diluting the oils with fractionated coconut oil (FCO), or by applying a small amount to the wrist. If it begins burning, apply a FCO to help dilute it. Dilution is a good practice for young children. Q: When applying multiple oils, do I need to wait between applying each oil, or can I apply one immediately after the other one? A: You do not need to wait between application of the different oils, they can be applied immediately on top of each other. It's better known as layering and is very effective when applying oils for a variety of uses. Q: Are essential oils effective for mental health? A: Yes! Essential oils such as Frankincense or sandalwood contain a naturally occurring chemical constituent that can go beyond the blood brain barrier and affect the brain to help cure diseases such as Alzheimers, Parkinson’s, multiple sclerosis, and Lou Gehrig’s. Essential oils can be a powerful key to help unlock and release emotional trauma, alleviate ADHD, nervous disorders, depression, addiction, and so forth by calming the mind. Q: What is the cost comparison of these oils to other brands? A: Compared with dozens of brands on the market for essentials and even high quality supplementation and considering their purity and potency, these oils are extremely competitive and cost is relatively low. Those with a wholesale membership receive greater discounts. Contact Us for more information on how to get deep discounts on every order. Topical use:Dilute one to two drops with Fractionated Coconut Oil then apply to desired area. See additional precautions below. Get Our Specials & Updates! © Copyright Total Health Is Natural, Inc./ThinNow.com, 2009-2018 - All rights reserved. All website design, text, graphics, photographs, software and other content are the exclusive property of ThinNow.com, and are protected by United States and international copyright laws. Any use of materials on this site, other than for the purpose of placing an order, including without limitation reproduction, modification, distribution, replication, commercial or other exploitation, or creation of derivative works, without prior written permission from an officer of ThinNow.com, is strictly prohibited. Enter your email address below and click the Send Password button.